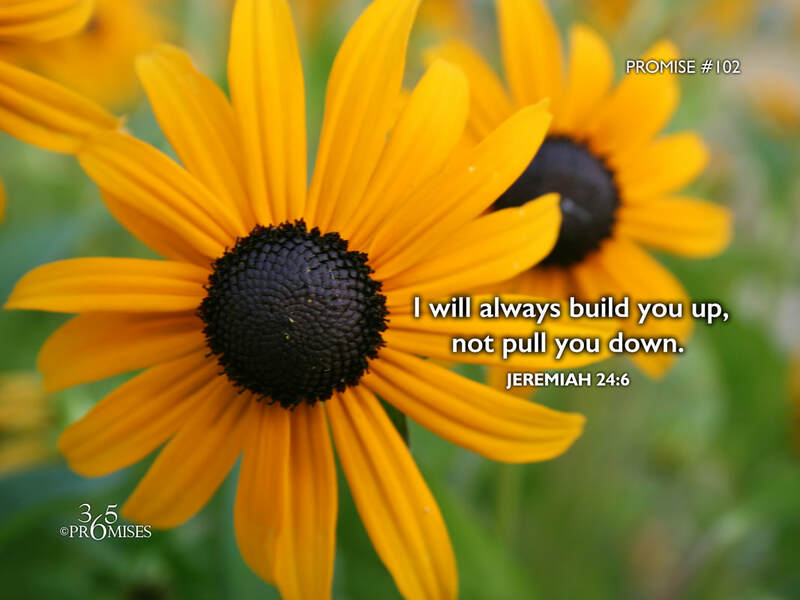 and I will build them, and not pull them down; and I will plant them, and not pluck them up. One of the ways an insecure person builds themselves up is by pulling other people down. By making somebody else look inferior, the person doing the 'pulling down' might feel superior, at least temporarily. While this is a very unhealthy way to go about life, many people think that God is waiting to do the same thing to us. He is just watching for an opportunity to criticize us and point out all shortcomings. The truth is that the exact opposite is true. God is not waiting to find fault in us, He is looking for every opportunity to pull us up! In today's promise, we read of God's heart for His people and His desire for only good things for them. He promises to only do good things for us, to build us up and to plant us in solid ground. Our God and Father is the most secure, loving, kind and compassionate father in the universe! He is always looking for new opportunities to encourage us so that we might fulfill our destiny as His beloved children. My prayer today is that we would simply believe that this is true. God is FOR us in every way!